A NEW Year's shark protection present for Northern Rivers residents spanning 800 metres from North Wall to Lighthouse Point is a step closer after the Eco Shark Barrier inventor visited Ballina today. 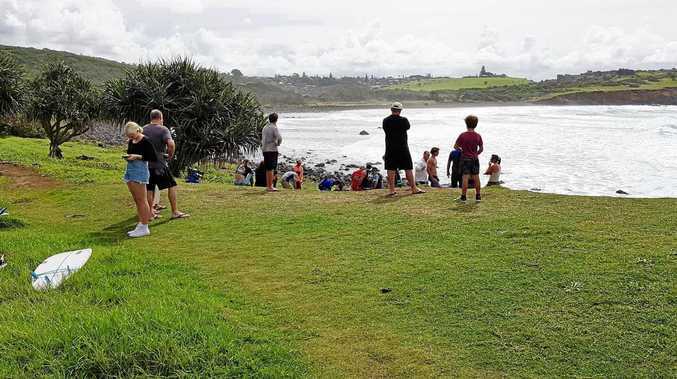 Ballina Mayor David Wright said he met with Eco Shark Barrier inventor Craig Moss and surf life savers at the scene of Tuesday's attack on Sam Morgan about 11am this morning. "The minister said we could ask him to price a net to go from North Wall through to Lighthouse Point and he said it could be done," he said. With only one 400 metre Eco Shark Barrier being trialled on Perth's Coogee Beach, Cr Wright said the Ballina net would be twice as long. He said the Eco Shark Barrier would be secured by 10, 12 metre long pylons which are driven six metres into the ocean floor. "We've got a piece of the netting and it's really strong," Cr Wright said. "It's got a 16 tonne per square metre breaking strain. "The net is made of very special plastic and it's got plasma rope that holds it together." In part of the 800 metre Eco Shark Barrier, Cr Wright said they discussed having a closed gate so boats can motor into the protected area. "We are going to have a gate in the middle with two pylons about three metres apart so that the rubber duckies and jet boats can get through," he said. "Otherwise it should fully enclose the whole of Lighthouse Beach so it will allow the nippers, swimmers and surfers to surf on North Wall safely. "Mr Moss hasn't done this before, this is all new, but he reckons he can do it all." The Eco Shark Barrier will take four weeks to construct, making installation before Christmas unlikely. "It's like putting together a giant Meccano set," Cr Wright said. "Mr Moss said it would take a few days to bring it over from Western Australia, about three or four days to put the pylons in, and about a week to put the actual net in between the pylons. "Then we're going to see if it stands up to storms and trees hitting it after floods. "It's in his best interest to make it work, because if it does work they will be doing more of them." As the Eco Shark Barrier uses yellow floats to keep it on the surface, Cr Wright said there may be some detractors. "There will be some people who will likely say that it's not pretty but if it means people's lives I think we should give it a try," he said.